If emergency towing is necessary, we recommend having it done by an authorized Kia dealer or a commercial tow-truck service. Proper lifting and towing procedures are necessary to prevent damage to the vehicle. The use of wheel dollies or flatbed is recommended. 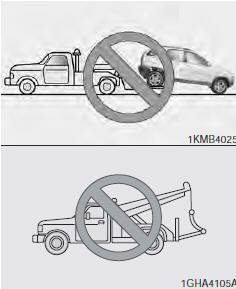 For trailer towing guidelines information, refer to section 5 “Driving Tips”. On 4WD vehicles, your vehicle must be towed with a wheel lift and dollies or flatbed equipment with all the wheels off the ground. On 2WD vehicles, it is acceptable to tow the vehicle with the rear wheels on the ground (without dollies) and the front wheels off the ground. When being towed by a commercial tow truck and wheel dollies are not used, the front of the vehicle should always be lifted, not the rear. NOTICE • Do not tow the vehicle backwards with the front wheels on the ground as this may cause damage to the vehicle. • Do not tow with sling-type equipment. Use wheel lift or flatbed equipment. When towing your vehicle in an emergency without wheel dollies : 1. Set the ignition switch in the ACC position. 2. Place the transaxle shift lever in N (Neutral). 3. Release the parking brake. NOTICE Failure to place the transaxle shift lever in N (Neutral) may cause internal damage to the transaxle. NOTICE • Attach a towing strap to the tow hook. • Using a portion of the vehicle other than the tow hooks for towing may damage the body of your vehicle. • Use only a cable or chain specifically intended for use in towing vehicles. Securely fasten the cable or chain to the towing hook provided. • Before emergency towing, check that the hook is not broken or damaged. • Fasten the towing cable or chain securely to the hook. • Do not jerk the hook. Apply steady and even force. • To avoid damaging the hook, do not pull from the side or at a vertical angle. Always pull straight ahead. CAUTION Use extreme caution when towing the vehicle. • Avoid sudden starts or erratic driving maneuvers which would place excessive stress on the emergency towing hook and towing cable or chain. The hook and towing cable or chain may break and cause serious injury or damage. • If the towing vehicle can hardly move, do not forcibly continue the towing. Contact an Authorized Kia dealer or a commercial tow truck service for assistance. • Tow the vehicle as straight ahead as possible. • Keep away from the vehicle during towing. • Use a towing strap less than 5 m (16 feet) long. Attach a white or red cloth (about 30 cm (12 inches) wide) in the middle of the strap for easy visibility. • Drive carefully so that the towing strap is not loosened during towing. When your vehicle is being towed by another vehicle other than a tow truck (in case of an emergency) • Turn the ignition switch to ACC so the steering wheel isn’t locked. • Place the transaxle shift lever in N (Neutral). • Release the parking bake. • Vehicles equipped with automatic transaxles should not exceed 45 km/h (28 mph) and should not be towed more than 80 km (50 miles). • Vehicles equipped with manual transaxle should not be towed in excess of 88 km/h (55 mph) and should not be towed more than 645 km (400 miles). • Press the brake pedal with more force than normal since you will have reduced brake performance. • More steering effort will be required because the power steering system will be disabled. • If you are driving down a long hill, the brakes may overheat and brake performance will be reduced. Stop often and let the brakes cool off. NOTICE To prevent internal damage to the transaxle, never tow your vehicle from the rear (backwards) with all four tires in contact with the surface. Tips for towing a stuck vehicle The following methods are effective when your vehicle is stuck in mud, sand or similar substances that prevent the vehicle from being driven out under its own power. • Remove the soil and sand, etc. from the front and the back of the tires. • Place a stone or wood under the tires.